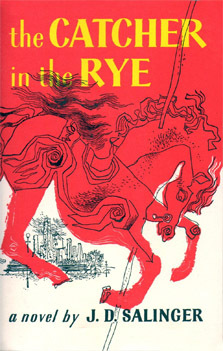 I had always held The Catcher in the Rye in mind as an archetypal coming of age novel which I had never read. It sat, on the bookshelves of my mind amongst Italo Calvino’s “Books That Everybody’s Read So It’s As If You Had Read Them.” The name Holden Caulfield familiar, like an old acquaintance whose face has been forgotten. Occasionally, I have the the feeling when reading a book for the first time that subconsciously I must have been saving it as a reward for myself. Regardless of the occasion, I look out especially for books with which I can identify. Something in Holden Caulfield’s outlook strikes a chord with me, though his experience of teenage life is far removed from my own. The genius of his character is his ability to extrapolate universals from the very limited and apparently immature perspective of his own experiences. His extrapolations are lampoons to the impulse to generalise – reflecting his naivety yet seemingly drawing out insightful conclusions despite his narrow experience; the privileged son of a wealthy ‘corporation lawyer’ (“boy, do those guys really haul it in”). Caulfield’s love of “a swiss cheese sandwich and a malted milk” is also strangely similar to some later iconic American sociopaths (Clarence Worley in True Romance: “I could eat a horse if you slapped enough ketchup on it”) of which he seems to be one. The honesty of Caulfield’s attitudes to food and drink pre-figures Tarantino’s tight characterisation of Worley’s almost psychotic relationship with food and eating (a relationship most explicitly plaid out in one of the most violent scenes of the film in which Worley is out ordering a chicken sandwich while his girlfriend is beaten half to death in their hotel room by a brutish James Gandolfini). The brevity of the book and the flex and slap of the prose belies the complexity of its writing, the delicate and indelicate leitmotifs (“Old Gatsby. Old Sport. That killed me … I was waiting for old Luce”), the clever patterning, the five years of writing that makes Holden Caulfield one of the best and most brashly defined characters that I can recall reading since I first read Anthony Burgess’, A Clockwork Orange. But it is not the innocence or naivety of the action in The Catcher in the Rye that is reminiscent of the clearly violent A Clockwork Orange or even of True Romance. It is the cold and violent use of the English language (“that really killed me”) and the lightning strikes of annihilation directed at the other characters in the novel that makes Caulfield’s performance so potent, cynical and entertaining: “She was dating this terrible guy, Al Pike … he was always hanging around the swimming pool. He wore those white Lastex kind of swimming trunks, and he was always going off the high dive. He did the same lousy old half gainer all day long. It was the only dive he could do, but he thought he was very hot stuff. All muscles and no brains.” His rasping assassinations inflected with his childish and incisive observations (“Goddam money. It always ends up making you blue as hell.”) make this one of the most enjoyable books I have read in months, reading each sentence like cutting with a well sharpened knife. Caulfield seems to roam from one place full of phonies to the next. He is both attracted to the places that they are attracted to and repulsed by their presence in them (“It’s one of those places that are supposed to be sophisticated and all, and the phonies are coming in the window”). Much more, it seems, he is a stranger in the place of his own existence. Someone who is not yet accepted, or who does not yet accept himself – personification of that difficult journey out of adolescence, always approaching adulthood, retreating into childhood. This apparent uncertainty lashes out at the other characters he encounters, blind always to his own issues (“Stop screaming at me please,” she said. Which was crap because I wasn’t even screaming at her.”) he attacks the many flaws of others in place of addressing his own – an intelligent and childish prism through which to view 1940s New York – a delightful one. The Catcher in the Rye has created a new category of books for my my mental shelving, one which it is leading by a mile: The Books You Have Recently Read And Now You Want Everybody To Read Them.